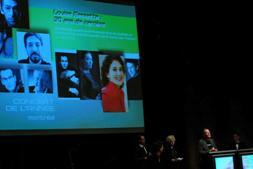 For Immediate Release, February 5, 2013, Montreal, QC Pianist Louise Bessette, hailed internationally as one of the pre-eminent interpreters of the music of our time, is this year's winner of two prestigious prizes from Le Conseil québécois de la musique. At the January 27 ceremony, Bessette was declared the winner of two Prix Opus for "Concert of the Year - Montreal" as well as "Concert of the Year - Modern and Contemporary," both for her extraordinary 30-year Career Celebration of last March, presented by Société de musique contemporaine du Québec (SMCQ), in collaboration with Chapelle historique du Bon-Pasteur. The multi-faceted three-part concert included four world premieres written for the occasion, along with music by her signature composer, Olivier Messiaen. The same day as the Montreal Prix Opus ceremony, Bessette gave the first of two recitals in the UK, at Nottingham Royal Concert Hall, with a program featuring music by Sir Arnold Bax, Fauré and Brahms, as well as Ernesto Lecuona's thrilling Suite Andalucia. "Bessette's performance had all of what we quickly came to recognise as the hallmarks of her playing," said Music and Vision, "precision, clarity and a beguiling range of colour." Three days later, at her all-Spanish program at The Church of St. John the Evangelist in Oxford, "[Bessette] played two outstanding tangos by Isaac Albeniz "just wonderful," said Oxford's Daily Info, adding "We ended the concert with a collective sigh of pleasure." And, new from ATMA Classique is a striking new recording with Quatuor Molinari featuring music by the stylistically-varied and intense Russian composer Alfred Schnittke. Bessette joins the string quartet for Schnittkes 1988 Piano Quartet, based on Mahler's chamber music sketches, and the 5-movement, Requiem-like Piano Quintet (1972-76). Recent concerts have taken Bessette to Toronto, Ottawa, Monterrey's Festival Internacional de Música Contemporánea (Mexico), as well as San Francisco with her chamber ensemble ARTefact. The ensemble includes cellist Yegor Dyachkov, Simon Aldrich, clarinet and has just welcomed a new member: violinist Carissa Klopoushak. In the coming months, Bessette performs a tribute to composer Gilles Tremblay with Toronto's New Music Concerts, and her all-Spanish recital program at Théâtre de la Ville's Festival Classica. LOUISE BESSETTE can be heard on over twenty recordings across ten labels. She has performed almost 40 world premieres, including many works written specifically for her. Louise Bessette is a Member of the Order of Canada, and Officier of the Ordre national du Québec. For more information, please see louisebessette.com.